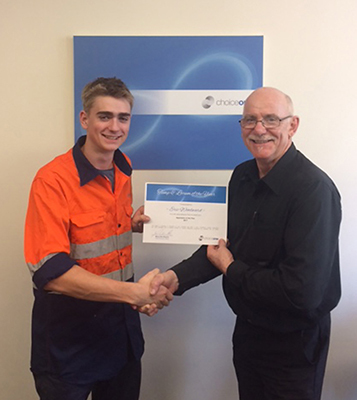 As an approved Group Training Organisation in Perth, ChoiceOne has placed over 200 apprentices and trainees. We know from years of experience that apprenticeships and traineeships truly work–building business and careers. When partnering with ChoiceOne, you enrol our full HR services. We manage the employer and training obligations, making it easy for both the individual and business owner to concentrate on what they do best! Starting a career can be challenging. Inexperience can only be overcome by experience. But how does one gain credible work experience if no one will hire you without experience? …the infamous ‘rock and a hard place’ scenario. Like other young Australians, Eric faced this situation before he was onboarded to our apprenticeship program. Originally placed for 10 months with a cabinet manufacturer in Armadale, an unfortunate down turn in the market rendered his apprenticeship redundant. However, in the face of difficult circumstances, Eric persevered and his persistence paid off. He was selected for an apprenticeship at Fremantle Furniture Factory! Based on his strong work assessment from his original apprenticeship, Eric stood out from a highly competitive field of candidates, winning the placement over 32 other applicants. Following Eric’s placement at Fremantle Furniture Factory Workshop Manager, Daniel Guettinger provided feedback to further affirm the young apprentice’s efforts while in the role. Feedback of Eric’s performance and attitude, willingness to assist, and Daniel’s long term perspective of Eric’s potential were strong influencing factors in our final decision making, selecting him as ChoiceOne’s Apprentice of the Year! Now a 2nd Year Apprentice Cabinet Maker (Certificate III in Cabinet Making), Eric continues his education at Thornlie South Metropolitan TAFE, while actively supporting Fremantle Furniture Factory’s business. At ChoiceOne, we pride ourselves in pairing employer with apprentice or trainee. Our success stems from our thorough evaluation and management of the entire process. We coordinate with stakeholders by recruiting candidates, identifying employers, organising training plans with Registered Training Organisations (RTO’s) and work with the Australian Apprenticeship Service Network and Department of Training and Workforce Development. Our commitment to providing a quality solution for skills development, actively supports business growth for businesses looking to expand their talent pool. If you are an individual interested in apprenticeships available in Perth or a business owner keen to grow your business, please get in touch with our Group Training Organisation team about our HR services.